The Candidate Fitness Assessment (CFA) was developed to measure and evaluate a candidate's potential to successfully complete the physical programs at the United States Naval Academy, United States Air Force Academy, and United States Military Academy. The CFA consists of six (6) physical and motor fitness events that are designed to measure muscular strength and endurance, cardio-respiratory endurance, power, balance, and agility. 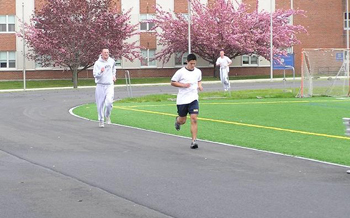 When administered together as a single battery, these six events will help the Admissions Board determine if a candidate possesses the stamina and movement skills required to successfully complete the physical program and perform the duties required of commissioned officers in the uniformed services. The six test events of the CFA are administered consecutively in less than a 40-minute time period. Candidates should attempt to do their best on all six events, keeping in mind that the events are sequenced to produce a cumulative loading effect. In other words, after completing the first five events, it is doubtful that a candidate will score his/her best on the 1-mile run. This has been considered in the development of the criterion-referenced standards, which will be used to evaluate performance in each of the six events. Candidates' raw scores will be converted to scale scores (0-100 points) based upon their performance on each event. The 100-point maximum score, by event and gender, are listed in the table below. A candidate who achieves the 100-point level on any of the first five events should not attempt further repetitions, as this will not improve his/her score. ADMINISTRATOR NOTE: Exam date must be submitted in the format DD-MON-YYYY with the first three letters of the month being spelled out. The attached calendar tool will fill in the entry automatically when selected. The CFA is an important component of the admissions process at each Service Academy and is used to determine if candidates can meet the physical rigors of military life. The test must be administered properly and standardized in order to accurately reflect a student's physical and motor fitness and to be fair to all candidates. The CFA MUST be administered by a high school/prep school physical education teacher, a coach, commissioned officer, or the candidate's Blue and Gold Officer. The test must also be administered according to the following directions in a single 40-minute time period. At the completion of testing, the administering official will submit the test scores via an emailed electronic module. 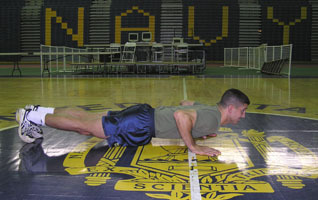 Submission of this test to the Naval Academy signifies affirmation that the test was administered to standard and that the scores accurately reflect the candidate's physical performance. Diagnostic testing is encouraged to help familiarize the candidate with the pace and stamina required to complete the entire test battery. THE OFFICIALLY REPORTED SCORES MUST ALL COME FROM A SINGLE TEST ADMINISTRATION. The following form may be printed and used for aid in recording and submitting test results. "You are about to take the United States Service Academies' Candidate Fitness Assessment. This test will measure your muscular strength and endurance, cardio-respiratory endurance, and motor fitness. The results of this test will be used in the admissions process at each service academy by demonstrating your level of physical and motor fitness. Listen closely to the test instructions. You may cease work when you have scored the maximum for any individual event. Otherwise, do your best on each event. You have 40 minutes to complete the entire test. After you complete each event, the scorer will record your raw score and the time the event was tested. If at any time you cannot continue to meet the timed requirements, the test will be terminated." Additional personnel will be needed to facilitate the administration of certain events, in particular the basketball throw. It may also be prudent to have control and/or medical personnel on site during the test, although they are not required. At a minimum, the physical education teacher should have an emergency action plan for getting help if needed. The administering official should prepare the test site and obtain any required equipment in advance of testing. The scorer and his/her assistants must be familiar with event instructions, and it is recommended that at least one copy of these instructions be printed for use during the test. The scorer should read aloud the instructions before each event. Scorers should have a clipboard and a writing instrument to record results and must maintain strict professional standards. Additional personnel may be used to assist with the administration of the events. Candidates should wear clothing and shoes that are appropriate for physical training such as shorts, T-shirts, socks, and running shoes (tennis/basketball shoes are not recommended). Any item that gives a candidate an unfair advantage is not permitted during the CFA. Wearing devices such as weight belts or elastic bandages may or may not provide an advantage. Such additional equipment is not authorized unless prescribed by medical personnel. The only exceptions are appropriate cold weather apparel while running outdoors. From a conceptual standpoint, the CFA was designed to be administered in two adjacent venues; an indoor gymnasium and an outdoor track. The gymnasium should be of sufficient size to permit testing the basketball throw. The space needed is approximately 100 linear feet (slightly longer than a standard basketball court). The pull-up bar should be of sufficient height (approximately 8 feet) that the candidate's feet will not touch the floor at full extension. The bar diameter should be no greater than 2 inches. The administering official should prearrange the first five events prior to the start of the testing. The 1-mile run is the last event administered in the CFA. Although it may be administered in an indoor gymnasium or stadium, time has been allotted for transit to an outdoor track. Regardless of the 1-mile run course, the running surface should be flat and free of debris. In either the indoor or outdoor facility, it is imperative that the 1-mile distance be measured accurately. In submitting the time for the run, the candidate and scorer are affirming that the 1-mile distance has been measured and is accurate. The test sequence will follow the order listed below. This order cannot be modified. There are no exceptions to this sequence or timing. * The 5-minute rest includes the transition time to the outdoor track. If the 1-mile run cannot be started by minute 30, an alternative arrangement for a running surface must be found. The following paragraphs describe the equipment, facilities, personnel, instructions, administration, timing techniques, and scorers' duties for each event. This measures ability to generate shoulder girdle power and total coordination/ balance in a stationary position. Keep his/her knees parallel to and behind the baseline and on the floor during the event. May use a 1-inch mat to cushion the knees. Execute three trials in a 2-minute time period. May use the non-throwing hand to steady the ball. Not touch the floor beyond the baseline with any part of the body until the basketball has landed. Note the event start time (should be 0:00). Extend the 100-foot tape measure the length of the testing area, perpendicular to the throwing baseline. Mark the point of impact with a pointer/yardstick for all three trials. Measure the perpendicular distance from the marked point of impact to the baseline. Record the event score for each trial to the nearest foot. This measures muscular strength and endurance of the shoulder, back, and arms and is an indicator of the ability to lift one's body weight in a pulling motion. Mount the bar with a pronated grip (back of the hands facing the candidate) with arms fully extended in a static hang. Not swing, kick, or bicycle legs during upward movement. Raise the body until the jaw line is above the bar and parallel to the ground. Execute each repetition on cadence (command). Return to a fully-extended static hang position to complete each repetition. Note the event start time (should be 5:00 elapsed). Before giving the "GO" command, ensure the candidate's elbows are fully extended and shoulders are relaxed in a "dead hang". If a candidate needs to use a chair to grip the bar, pull the chair away and take the time to ensure the candidate is in a straight-armed, relaxed shoulder "dead hang" before beginning. Do not allow the candidate to jump off the ground or a chair to gain momentum for the first repetition. Require a short fully-extended period before giving the "GO" command. On the command "GO" start the event. When the candidate's chin rises above the bar, command "DOWN". When the candidate reaches the starting position with arms fully extended, command "UP". At the end of 2 minutes, command "STOP", and record the number of correctly executed repetitions. May steady the candidate by extending an arm in front of him/her on each repetition. Monitor each repetition to determine that the candidate's chin is parallel to the ground and over the bar in the up position and that arms are fully extended in the down position. When a candidate reaches the maximum number of repetitions in under the 2-minute period (18 for men; 7 for women), the command "STOP" will be given. Correct execution- chin is over but not touching the bar. Assistant may steady swing. This is an alternative measure of muscular strength and endurance. If a woman can successfully perform 1 correct cadence pull-up, it is to her advantage on the scoring scale to use the pull-up result instead of a flexed-arm hang. The scale score (0-100) for 1 cadence pull-up is higher than the highest scale score for a maximum score on the flexed-arm hang. Stand on a chair, steps, box, or ladder or be boosted up to the bar by an assistant until her chin is above the bar. Mount the bar with a pronated grip (back of the hands facing the candidate) with chin parallel to the floor and above the bar. Step off from the platform or assistance device. Not swing, kick, or bicycle legs during the event. Maintain a flexed-arm position with chin above the bar and jaw line parallel to the ground throughout the event. Note the event start time. Give the "GO" command to start the event and the stopwatch. Monitor body position to determine that the chin remains above the bar and the jaw line is parallel to the floor. Record the score in seconds. Stopwatch is started when arms are fully flexed and chin is leveled above bar. "GO" command is given. This measures the ability to move rapidly while changing directions. Indicator of anaerobic power, agility, and quickness. Begin the test with his/her entire body behind the start/finish line. On the "GO" command, sprint 30 feet to the turn-around line. His/her foot and hand must simultaneously touch the floor on or beyond the turn-around line. Candidate will then sprint back to the start/finish line, touch on or beyond the start/finish line, sprinting back to the 30-foot line. Candidate touches on or beyond the turn-around line and then sprints back across the start/finish line to complete the trial. This is a total of a 40-yard shuttle run. Execute two trials with a 1-minute rest between trials. Note the event start time (Should be 10:00 elapsed). Measure the shuttle run course of 30 feet from a baseline. Give the "GO" command to start the event; start stopwatch. Monitor the candidate to determine that he/she places hand and foot beyond the measured line on each turn. Record the best of the two trials in seconds/tenths of seconds. The test is begun with the candidate's body behind the start/finish line. This measures abdominal/core body muscular endurance. 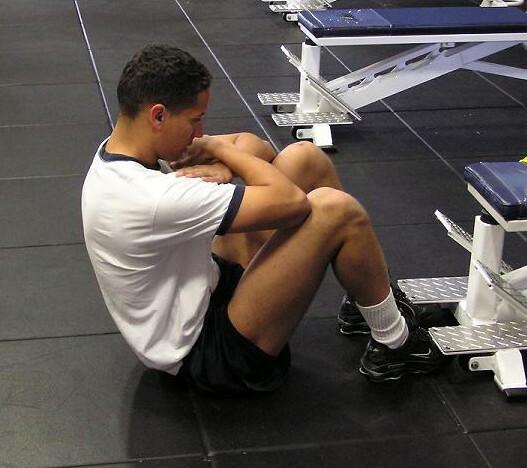 Assume a supine (back on floor), bent-knee position (approximately 90-degree bend) on a mat with arms crossed, fingers extended, touching the top of the shoulders, with shoulder blades touching the floor/mat. Upon the command "GO", flex from the hip, raising the elbows so that they touch the front midpoint (or higher) of the thigh without finger tips losing contact with the top of the shoulders; extend from the hip until the shoulder blades touch the floor/mat. Candidates cannot rest in the down position. Resting is only permitted in the up position. Fingers must stay in contact with the top of the shoulders while resting, and candidates cannot grab their legs or touch the ground with their hands. Note the event start time (should be 15:00 elapsed). Monitor the start position to determine that the candidate's shoulder blades are touching the mat, fingers are touching the shoulders, knees are bent approximately 90 degrees, and an assistant is properly holding the candidate's feet (hands only on top of each ankle or foot). Give the command "GO" and start a stopwatch for the 2-minute trial. Count one repetition each time the candidate's shoulder blades touch the floor/mat. Monitor body position making sure during each repetition that the buttocks stay in contact with the mat, knees are bent appropriately, hands remain in contact with the shoulders, elbows make contact with the mid-thigh, and shoulder blades touch the floor/mat. Verbalize "NO" for any repetition that does not meet the criteria listed above. Stop the test at the 2-minute mark and record the number of repetitions. This measures upper body muscular endurance. Assume a prone (abdomen toward the ground) position supported on one knee on a 1-inch mat or a hard surface floor. On the command "READY POSITION", assume the front-leaning rest position (arms extended) by placing your hands where they are comfortable (Width is variable). Feet may be together or up to 12 inches apart. When viewed from the side, your body should form a straight line from your shoulders to your ankles. 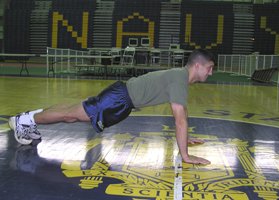 On the command "GO", begin the push-up event by bending elbows and lowering entire body as a single unit until your upper arms are at least parallel to the ground (90-degree bend). Return to the starting position by extending arms and raising entire body as a single unit until arms are fully extended. May rest in the up position, flexing or bowing the back as long as hands and feet remain in contact with the floor, and no other body part touches the floor. Must return to the generally straight body position before attempting another repetition. Give the command "GO" and start a stopwatch for a 2-minute trial. Monitor each repetition, making sure body remains straight, moving as a single unit, upper arm is parallel to the floor in the down position, and the arms come to full extension in the up position. Terminate the event if the candidate lifts a hand or foot off the ground or touches the ground with any body part other than the hands or feet. This measures aerobic capacity and endurance. Run continuously for one mile (walking is allowed although strongly discouraged). Certify the 1-mile run distance. Give the command "GO" and start a stopwatch. Receive physical help during the event. Leave the designated running course for any reason. Receive pacing by another person. Stop the watch as the candidate crosses the finish line, and record the score in minutes and seconds. This is the end of the Candidate Fitness Assessment. If problems are encountered during the administration of the test or in the electronic submission of scores, please contact the Office of Admissions via email or at (410) 293-1858.